The last time we saw Call of Cthulhu: The Official Video Game, it was starting to really come together. At Focus Home Interactive’s recent Le What’s Next De Focus event in Paris, developer Cyanide showed us an entirely new sequence of their upcoming investigative survival horror RPG. We have our impressions ready for you below. Call of Cthulhu is being built in the Unreal Engine 4, as are several other games featured at Focus Home Interactive’s event. Assets looked fine, if not extraordinary, and the final product should run smoothly on the PlayStation 4. Since a lot of typical game engine problems are already solved in Unreal, Cyanide Studio is able to focus on producing the best content they can. The result is a good-looking game which plays it safe, not pushing any presentation boundaries, but also achieving a distinct art style. The story in Call of Cthulhu hasn’t changed since the last time we saw the game. Private Investigator Edward Pierce has been sent here to attempt to put together what happened to a local famous painter, Sarah Hawkins, and her husband Charles, both of whom were allegedly murdered. The demo began with Edward dropping anchor at a local fishing city along the coast nearby the estate in which the supposed murder took place. The city shown during our demo was a lazy seaport, one which has seen better days. A whale has washed up, likely providing action to the inhabitants that they haven’t seen in quite some time. 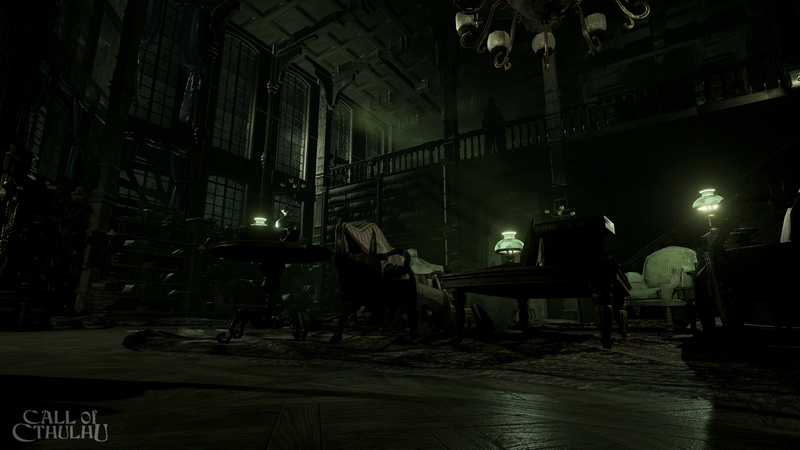 Call of Cthulhu is a first-person game, where having a keen eye for details can help Edward’s case. Talking with people around town can result in possible ways to solve a problem to be revealed. In this case, Edward was trying to figure out a way to get into a warehouse. According to the Cyanide Studio representative showing us the demo, there were at least three ways to gain access to the building, depending on the amount of exploration the player performed, or whether or not the right person was spoken to in order to simply unlock the building. It’s the different ways that each scenario can play out which will drive players to replay Call of Cthulhu, multiple times, and is a promising feature. One aspect of Call of Cthulhu which was not shown was the phobias system. As Edward dives deeper into the murder mystery, he will encounter otherworldly horrors. Repeated exposure to traumatic encounters can drive Edward to develop random phobias. These can impact the game, by making scenarios more difficult, or even spawning enemies that don’t actually exist, but which can do real damage to him. Perhaps the systems that need to be in place for this mechanic to work properly aren’t quite ready for showtime. Whatever the case, it was a shame it was not shown, since the concept sounds intriguing. Further details revealed during our demo included the fact that Call of Cthulhu will feature four separate endings, depending on choices made. So for those who enjoy playing games multiple times in the quest to see everything, Call of Cthulhu will hopefully be a game played in such a way. It’s a game that is intended to be played by people who enjoy sharing notes with others on what exactly they experienced, and how such different playthroughs could result in such varying endings. Call of Cthulhu: The Official Video Game looks like it will please gamers who enjoy a good paranormal whodunit. Multiple endings should ensure increased play time as well, while the concept of developing game-changing phobias will also change things up in unexpected and delightful ways. Cyanide Studio is hard at work putting the final touches in, and Call of Cthulhu should launch later in 2018. PlayStation LifeStyle would like to thank Cyanide Studio and Focus Home Interactive for showing us the latest development progress for Call of Cthulhu: The Official Video Game. Watch this space for more information on this and other games from the Le What’s Next De Focus event, coming soon!